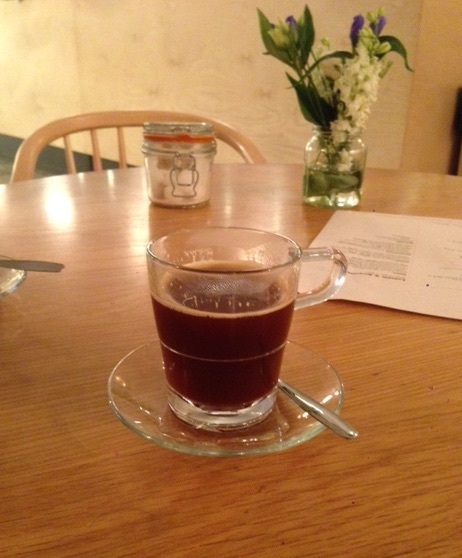 A café with good coffee in a theatre? I admit to being a little dubious when I first read about Penny at the Old Vic. Fortunately, there was no reason to be concerned. Penny serves Workshop coffee in an unusual setting (even accounting for the fact it is in a theatre). Going through the doors to the Old Vic, you turn left and head down a staircase to the basement where a long counter stretches out in front of you and to your right. Being a theatre café, there were a wide selection of snacks, bar meals, beer and wine in addition to the coffee being served with the La Marzocco espresso machine. As you’d expect, the usual range of coffees were on offer but if you prefer non-dairy milk, there was oat and almond available in addition to the more usual soy based milk. (Although almond milk is one to watch for if you have a tree-nut allergy as there is a risk of cross contamination). There was also a wide selection of chairs and tables to choose from, ranging from a standard table, to a high table with stools and, around the corner, some chairs that look like you can sink into them and enjoy your coffee way after the performance has been called. The café is open all day (in fact from 8am until 1am on week days) and, if you are not there during a performance is quite spacious (though during the intervals it could probably get quite crowded). 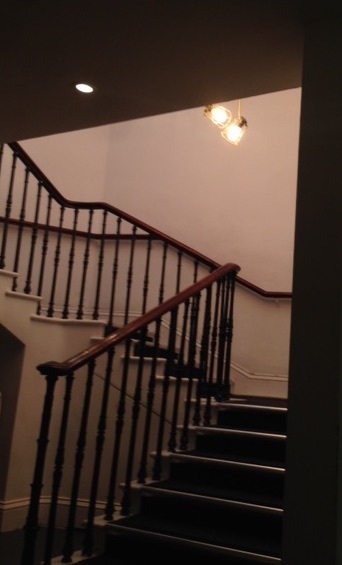 The lighting on the staircase periodically got brighter and then dimmer. How easy is it to keep our national electrical supply constant such that blackouts and brownouts are not a problem? 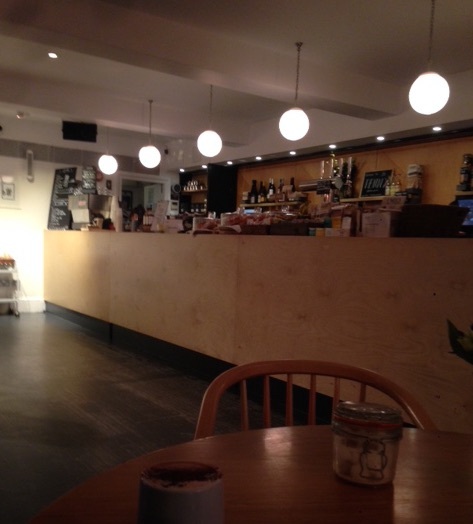 The café certainly provides a service for good coffee in Waterloo (it’s within 5 minutes walk from the station) and it is a great place for refreshment if you are visiting the theatre, but is it also the sort of place at which you can slow down and enjoy the moment? The type of neighbourhood café where you can sip your coffee while letting your mind wander onto a café inspired thought train? At first glance, it is perhaps unpromising as it has clearly been renovated and made to be a modern café. But then, thought trains do not happen “at first glance” but as a result of slowing down, sitting, watching and absorbing the surroundings. It is as you do this that I think Penny at the Old Vic starts to speak to you. The first thing that you may notice is the lighting. A number of different types of lightbulb including an industrial looking art-piece on the stairwell coupled to what appeared to be natural light coming down through another staircase. This theatre was first built in 1816-1818¹ (but with significant rebuilds since then), how was the stage lit at that time? Where did the theatre patrons go to get a cup of coffee or a glass of wine between the scenes and how could they see anything in the dark? Around 3.5 miles away, one of the first housing developments to have electric lighting was being constructed in the 1860s. The electricity was supplied by seven steam engines housed in a building just off High St Kensington and sent to the new development next door, “Kensington Court”¹. Evidence of the electrical power station (which supplied DC not AC electricity) can still be seen on a stone sign on the building alerting passers by to the “Electric Lighting company”. It is probable that no such set of steam engines provided power for the lighting in the Old Vic, which was more likely still run on candles and gas lighting. However, it is something that was nearly contemporary with the development of Kensington Court that gives this post its title. It is also the reason behind the name of the cafe. 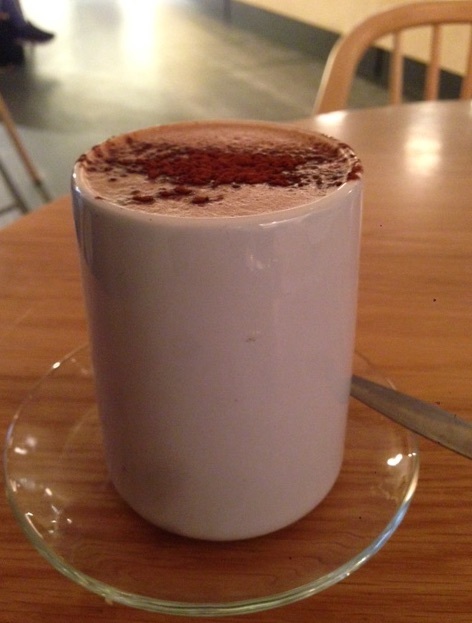 Lord Kelvin got thinking about viscosity as a consequence of drinking a hot chocolate. In the 1880s, a woman called Emma Cons took control over what is now the Old Vic. When she ran it, the theatre was called the “Royal Victoria Hall and Coffee Tavern” and ran ‘morally decent‘ productions for local people (note though the importance of the coffee to the project!). These productions included scientific lectures for which the entrance fee was a penny, hence, apparently, the Penny café. Apparently she also ran science classes in the disused dressing rooms and, though the mind boggles as to what experiments were done in this theatre at that time, the classes and the lectures were so popular that soon, Cons founded Morley College to continue this adult education. Morley College continues as an adult education college to this day and is now one of London’s oldest adult education colleges. So it would appear that, even though the Penny café is a relatively new addition to the Old Vic theatre as we know it, the associations between the theatre and coffee (and the theatre and science) go back a long way. First appearances can be deceptive and, with good coffee and much to ponder, the Penny is definitely one to sink into a chair and to listen. Penny at the Old Vic.